As I write, David Chambers is finalising the 48pp of photographs of early Daniel printing for this new title. The 72pp of text have been printed, the spine labels made ready, and the two tip-ins that we have printed on David's parlour press sit in two tidy piles. All should be ready for the binders by the end of the month. The type arrived from Harry McIntosh in June, as usual packaged up into plastic buckets. Given the delicate state of my back I asked him to load each with a little less type than usual this time round, so a dozen or so arrived, the delivery man getting shorter with each delivery. "What's in these? Lead?" Close. I made up all the type into pages over the following weeks and started printing at the end of the month. Everything went pretty much according to plan, with just a couple of close-disasters, all dutifully recorded at our website: click on the 'at work' button on the left of the home page, and then select the button for this book in the list. One novelty on this book has been that we have included a couple of tip-ins of reproductions of early Daniel items, not in itself unusual but we printed them on a nineteenth-century parlour press known as a Ruthven after its Edinburgh inventor, John Ruthven. Henry Daniel's bibliographer, Falconer Madan, asserted that the Daniel family printed at home on a small Albion that Henry later took to Oxford, but his description of its unusual mechanism makes it certain that it was in fact a Ruthven, so it was entirely appropriate that we print the tip-ins from blocks on David's Ruthven. You can watch a short video of the press at work here. I now have the type ready for this book and will be working on it in the coming months. As a reminder, I acquired fifty-three proof sheets from the Daniel Press in Oxford, dating from between 1883 and 1897, complete with the Reverend Henry Daniel's pencil corrections. This short book will describe what they tell us about Daniel's printing practices in Oxford. The book will be 32pp of 12pt Caslon printed on an antique Turkey Mill wove, and there will be a dozen photographs of the materials themselves. The binding will be uniform with The Daniel Press in Frome. A small edition, so please contact us if you are interested in a copy. Oxford is of course the show that you must go to if you can. Lots of presses, specialist dealers, suppliers, and related organisations will have stands. There will be four lectures on the Sunday, and the Judges' Choice Awards and the new Parrot Prize will also be awarded on Sunday. For more details visit the FPBA website. 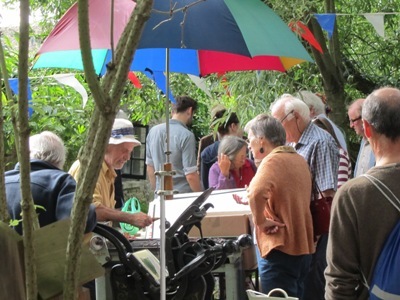 As usual John and Rose Randle generously opened up the area around the Whittington Press for stall-holders, who seem to increase in numbers every year. This year printing, type-casting, marbling, wood-engraving, and pochoir were all on the go - a mini Art in Action - as well as other printers exhibiting their work. And the rain held off, even letting through a little sun.